Mosaic Blog is hosted by Multicultural Mosaic Foundation (MMF). MMF is a non-profit dedicated to promote understanding, dialog and peace. « PRESS RELEASE: Response to threatening messages. Greece – a cradle of Western civilization, home of the first democracy, and birthplace of Socrates, one of the founders of Western Philosophy. 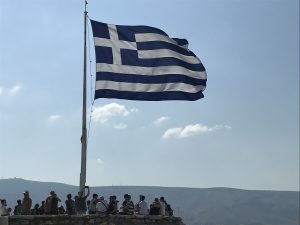 I’d always wanted to visit Greece, but as someone with Turkish heritage, the word “Greek” contained a bitter aftertaste. First of all, the Greeks and Turks have had a long and often bloody historical rivalry going back several centuries. Adding the invasion of Cyprus in 1974 by Turkish troops and the current political rift between the two nations; a lot of bad blood has yet to be wiped away. According to a recent report by the Hrant Dink Foundation in Turkey, Greeks rank among the top three ethnic groups targeted for hate speech by the Turkish media. In spite of all this, in July 2018, my beloved wife Miya and I – a couple of Turkish descent who grew up in Germany and live in the US – decided to travel to Athens, Greece. The following is a collection of our expectations, observations, experiences, and surprises. We arrived late in the evening at the Athens International Airport, the “Eleftherios Venizelos,” and took a taxi to our hotel in the center of Athens. Our driver, a very kind family man in his 50s named Dmitris, was very curious about our background and purpose in Greece. Dimitris’ father was born in a city in South Western Turkey called Alikarnassós during Ottoman times, known today as Bodrum, As part of the Lausanne Peace Treaty, signed in 1923, a compulsory population exchange between Turkey and Greece took place. Dimitris’ father had to leave his home to settle in Athens. About 1.2 million Greek Christians were sent from Turkey to Greece and about 350.000 Muslims were sent from Greece to Turkey in the early 1920s. 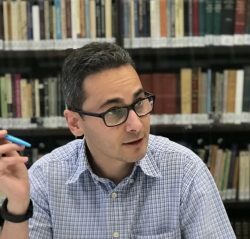 I told Dimitris that my great-grandparents belonged to the Muslim minority that lived in the city of Parga in Northwestern Greece, and had to leave for Turkey because of the same agreement between the two nation states. This mutual history of uprootedness and exile filled the beginning of our trip with a faint sense of irony. As we drove through the dark, narrow alleys of Athens, Dmitris and I agreed that the past was filled with unfortunate episodes for the land our ancestors dwelt on. An early surprise: the Ekklisia Kimisi Theotokou Chrisospileotissis – Greek Orthodox Church. We made sure to rise early the next morning. 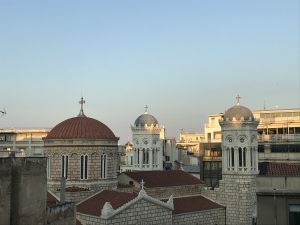 As I opened the window of our hotel room, we were amazed to see the dome of the beautiful and spectacular Ekklisia Kimisi Theotokou Chrisospileotissis – Greek Orthodox Church. 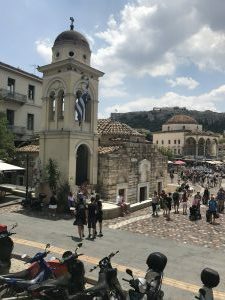 Walking through the alleys and streets of Athens, we made sure to stop to observe the buildings, churches, architectures, and monuments we passed by. 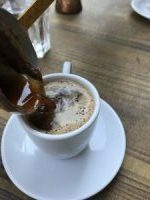 We talked to people from all walks of life over cups of Greek coffee. A few years ago, I travelled with my Greek-American friend John to Turkey. I took him to the Mausoleum of the founder of the republic of Turkey, Mustafa Kemal Ataturk, in Ankara. I later realized that this decision was a particularly insensitive faux pas toward John. Along with our guide, John and I walked through the halls of the nationalist Anitkabir museum, learning about how the heroic Turks fought against the dastardly Greeks in several wars. Greeks were portrayed in the museum as aggressive oppressors and occupiers of Turkish lands. About half-way through the museum, John couldn’t take it anymore and asked me to leave the museum. He added that he could take me to Greece where I could listen to the same stories about Turks who committed barbaric and shameful acts against the Greeks. I respected John’s reaction but wasn’t sure what he was talking about exactly until my recent trip to Athens. 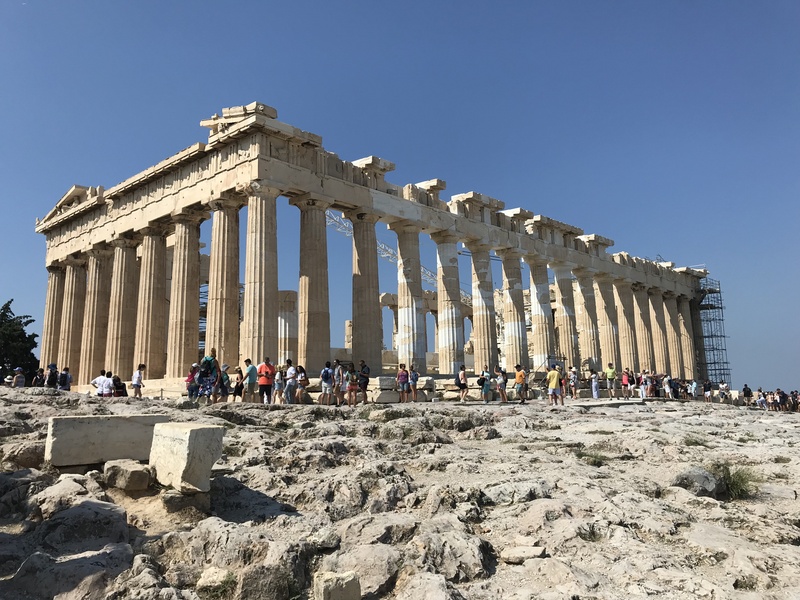 Miya and I hopped on a fancy double-decker bus to tour some of Greece’s most significant sites: the Roman Agora, Areopagus, Acropolis, Monastiraki Square, Rizari Park, Academy of Athens, National Archeological Museum, etc… We learned about the historical importance of the sites we visited and why they mattered. By the Greek Parliament across the Syntagma Square, which is the central point of Athens, our guide explained the meaning of the Presidential Guards that looked over the tomb of the Unknown Soldier–a tomb dedicated to the memory of Greek soldiers who perished during war. The guards’ uniforms resembling those worn by Greek fighters who fought during the Greek Independence War (1821–32) against the Ottoman Turks. Part of the uniform is the fustanella, a skirt-like garment with 400 pleats symbolizing each year under Ottoman rule, an era remembered in the official Greek narrative as a time of great suffering, occupation and oppression. I realized that Greeks and Turks tell very similar stories about their victimhood (and of their enemies) in order to justify their own heroism in wars fought between the two sides. As Muslims, we also wanted to see Muslims monuments. We found two: the Fethiye and Tzistarakis mosques. 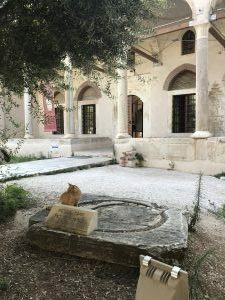 Both Ottoman era mosques are located in the heart of Athens and function today as museums. We were able to go inside the Fethiye mosque and were only allowed to see the niche of the Imam. The Islamic art on the walls were all covered with paint. A must see in Athens is, of course, the Acropolis, the ancient citadel on a hill above the city of Athens with a history that stretches back to the 5th century BC. We bit the bullet and hiked in 35C heat and high humidity up to the hill, and it was absolutely worth the labor. As Miya and I gazed like little kids at the Acropolis, an astonishingly beautiful monument built thousands of years ago, I couldn’t help but wonder what the builders would’ve have said if they were told that, one day, millions of tourists would travel from all around the world to admire their structure. History, as it turns out, is all about unanswered questions. Our short trip to Athens gave us a glimpse into the beauty and richness of Greece. We were able to breathe in the culture, taste the food, interact with locals, and gaze upon the remnants of a proud history. We could also observe the familiar tricks of nationalism being used (in a very similar way among Turks) to create cohesion in a society that has gone through hard economic times. Even though Greece is still recovering from its recent economic crisis, we were able to witness the open heart of Greeks for refugees. Greece welcomed thousands of refugees from Syria, Turkey, Afghanistan and Pakistan in recent years. We were also very sad to learn about the wildfires around Athens. PRESS RELEASE: Response to threatening messages.